Now on its third year, join Iya Villania, Chesca Garcia-Kramer and Angel Aquino as “Us Girls” hails the country’s most gorgeous and stylish icons tonight, August 18 at Amber, the Fort in Taguig City. Anne Curtis will accept the prestigious Icon of the Year award, which was brought home last year by Angel Locsin. Vying for the Face of the Year award are television princesses Maja Salvador, Julia Montes, Jennylyn Mercado, and Marian Rivera, while stylist Liz Uy, models Isabelle Daza and Georgina Wilson, and TV stars Kim Chiu and Bianca Gonzales will compete for the Most Fashionable Female title. Broadcaster Gretchen Fullido, host Bianca Manalo and model-actresses Cristine Reyes, Regine Angeles and Solenn Heusaff are up for the Sexiest Female title. Meanwhile, actors Sam Milby, John Lloyd Cruz, Gerald Anderson, Dingdong Dantes and entrepreneur Hayden Kho will compete for the Most Fashionable Male award, while the Sexiest Male nominees are Daniel Matsunaga, Derek Ramsay, Xian Lim, Phil Younghusband, and Matteo Guidicelli. Not to be outshined are the people who glam up our favorite celebrities, including Steven Doloso, RB Chanco, Ricci Chan and Albert Kuriniawan – contenders for the Make Up Artist of the Year. Fashion royalties Bang Pineda, Patty Yap, Kim and Boop Yap and Geolette Esguerra are the nominees for the Stylist of the Year. 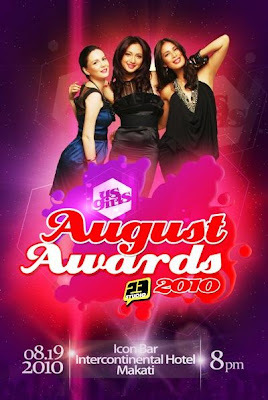 The “Us Girls”’ staff and Studio 23 management’s choice will determine the winners, as well as the viewers’ votes. The glamorous event will be televised in a two-part airing on August 25 and September 1 at 9:30 PM on Studio 23.